The Caboose was my easiest c-section recovery but I think she's also given me my hardest post-partum experience, if that makes any sense. I look in the mirror and feel like I'm still not "back to myself" yet. It's coming! Just...slowly. I'm still pretty mushy but regular workouts are starting to help with that. My hair is still falling out but I feel like it's less and less at each shower. I have crazy under-eye bags but Aaron started taking the 2am feeding (I handle 11 and 4. Yes my baby still eats EVERY THREE HOURS) so I'm actually getting some sleep these days. 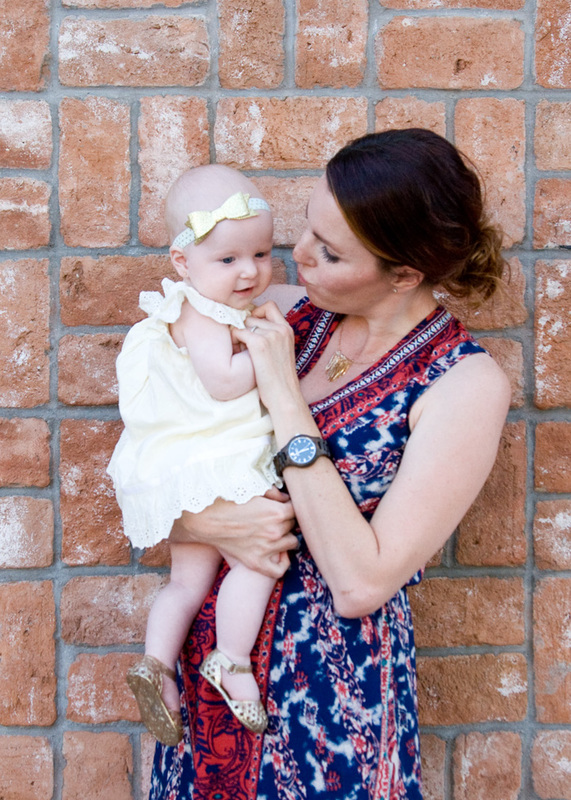 There's a light at the end of this post-partum tunnel, you know? She was super nervous about all the cars. In the meantime, a little bit of pretty goes a long way. 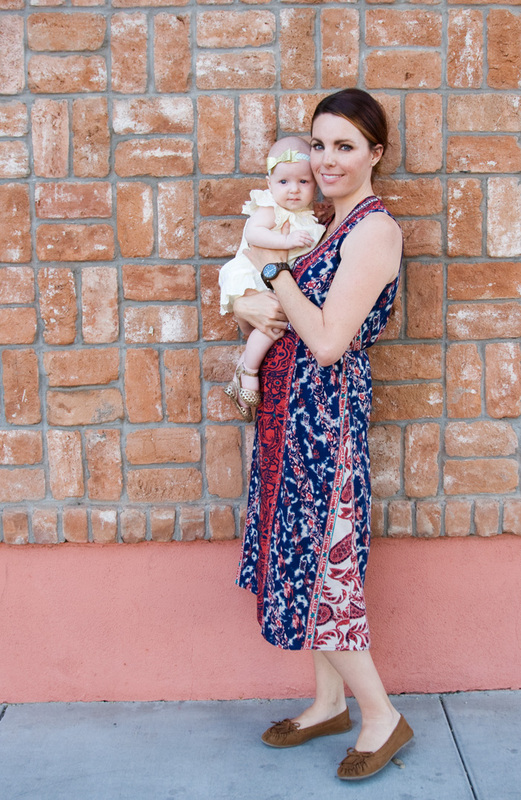 A lightweight nursing-friendly dress. This gorgeous necklace I picked up at Phoenix Flea a few weeks ago. This awesome wood watch that Jord sent me. Thanks to Camille for acting as photographer! Want a pretty box like this to show on your doorstep? Jord has generously offered a $120 gift certificate to one lucky Freckles in April reader so she (or he!) 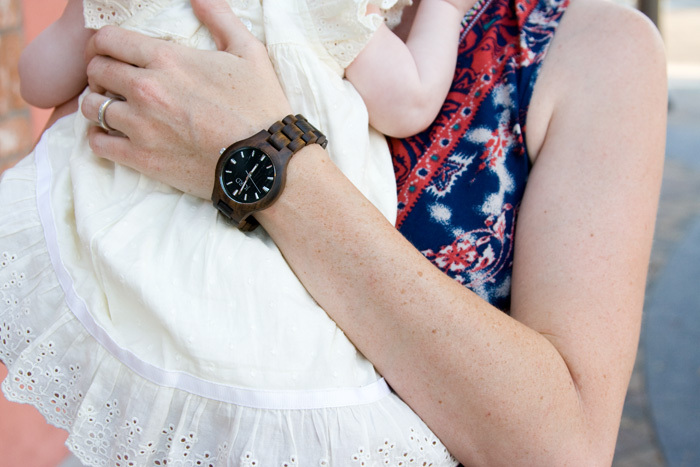 can pick out whichever wood watch makes her (or his!) heart happy. To enter just go fill out this form and we will pick a winner on April 17! oh my goodness, those are beautiful! i love those! if i don't win the giveaway i'm definitely going to have to save up for one of those. so fun! and you and baby both look great! You look so pretty! My postpartum time after #3 was definitely more difficult as well. 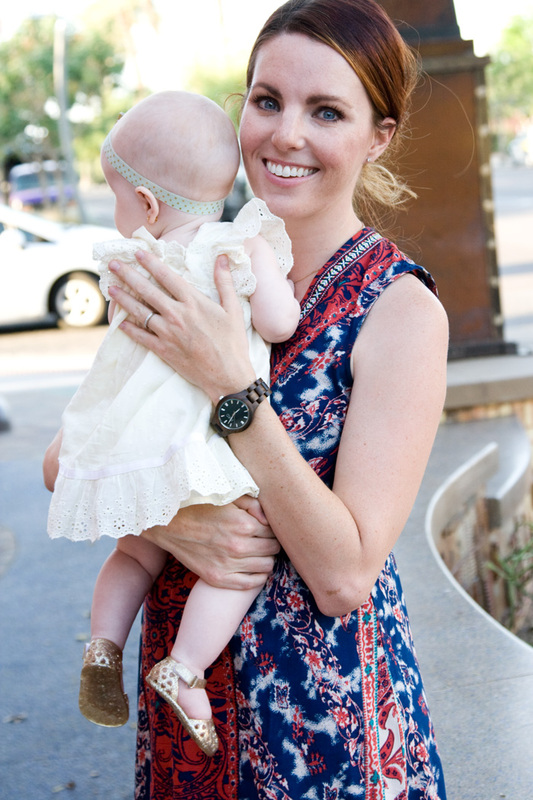 Rocking the dress, the watch, and the baby! You are both simply adorable. I have a pic holding my oldest up like that...17 yrs ago!!! Really does fly, miss the baby days. Glad to have found your blog!!! Those lil gold jellies......so cute!!! Cute Baby and cute dress....! I am way past this stage..mine are grown...makes me kinda sad....but on the other hand..some freedom is nice..enjoy it goes fast! You do look fabulous! And also…what is your workout of choice?? And… my baby is still getting up three bleeping times a night too! I think our babies were meant to be friends. Well I probably need to buy that dress so we can be twinners. I bought my husband a wood Jord watch and he gets compliments on it every time he wears it! I am fascinated by the craftsmanship.